Tamara Blaine, 22, died in July after she suffered a bad reaction to silicone another woman injected into her, police said. 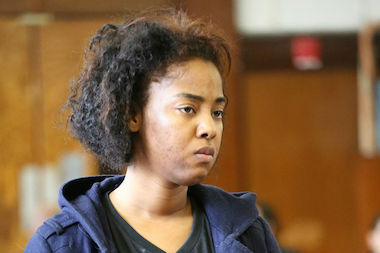 MANHATTAN — A woman who fatally injected a 22-year-old mother's buttocks with silicone at a pay-by-the-hour Meatpacking District hotel left her patient writhing and foaming at the mouth for 90 minutes before summoning help, sources said. Tamira M. Mobley, a 28-year-old from Wood Ridge, N.J., was arrested Monday and accused of killing Tamara Blaine, who was found convulsing on a bed inside a second-floor room at the Liberty Inn Hotel, at 51 10th Ave., at 12:33 p.m. on July 8, police said. Blaine, whose obituary listed her as a college freshman at the time, was taken to St. Luke's hospital and pronounced dead, police said. BLAINE'S MOTHER SEARCHED FOR HER DAUGHTER FOR A MONTH BEFORE LEARNING SHE HAD DIED. Tamira Mobley, 29, of New Jersey, was arrested on homicide charges after allegedly injecting silicone into the buttocks of Tamara Blaine, 22, inside the Liberty Inn in the Meatpacking District. Blaine's mother, Lola Blaine, was still distraught over her daughter's death when reporters spoke to her outside the family's home in St. Albans, Queens, Tuesday morning. "What am I going to say about her now that she's dead? Let me live with that for the rest of my life," the grieving mother said. "She died. It's the pain." The older Blaine was upset about the new focus on her daughter's death, she said. "She's dead. She's dead and now she's coming back in the news," she said. An initial autopsy into Blaine's death was inconclusive — but the medical examiner's office noticed puncture wounds on Blaine's posterior and realized that she could not have made them herself, sources said. The medical examiner's office ruled Blaine's death a homicide on Oct. 7 and said that the injected silicone went into her veins and asphyxiated her, according to police and prosecutors. Blaine had received injections from Mobley three other times — twice in 2012 and again in 2013, prosecutors said. Mobley had administered the procedure to many other women over the course of two years, prosecutors said. Mobley was arraigned on assault and manslaughter charges and held on $100,000 cash bond Tuesday morning. Her lawyer, Olayinka Dansalani, declinded to comment on the charges. She was not licensed to practice medicine in New York, according to records and prosecutors. A Tamira M. Mobley, also of Wood Ridge, was issued a New Jersey cosmetology and hairstyling license in Oct. 2013, records show. Sources said so much time passed between the homicide ruling and Mobley's arrest because police were conducting "a thorough investigation." Liberty Inn bills itself as a rendezvous point for lovers that bills on an hourly basis, according to its website. Investigators recovered surveillance video from the hotel that showed Blaine arriving ahead of Mobley and taking a seat in the lobby, sources said. Mobley then walked into the hotel clutching two large purses and handed her Wells Fargo credit card to the front desk, prosecutors and police sources said. The video later shows Mobley returning to the lobby and telling the front desk to call 911, sources said. Mobley waited 90 minutes after Blaine started having a bad reaction to the silicone before going for help, sources said. 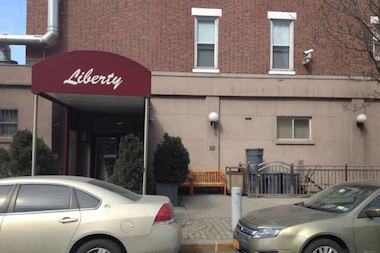 The Liberty Inn Hotel, 51 10th Ave., where Tamira Mobley, 28, is accused of giving a fatal silicone injection to 22-year-old Tamara Blaine on July 8, 2013. Mobley traveled with her ailing patient to St. Luke's Hospital, where she told officials that she had no idea went wrong and left, sources said. Investigators tracked Mobley with the credit card she had used to pay for the room, sources said. On Monday, New York police visited Mobley's home in Wood Ridge, N.J., and she agreed to accompany them back to the 6th Precinct stationhouse in Greenwich Village while they searched her home, sources said. She told police that she distributed illegal cosmetics and admitted that she met with Blaine at the hotel, but denied injecting her, sources said. Friends said they were relieved to learn somebody was being held responsible for Blaine's death. "It's sad. I was shocked. It was very upsetting. 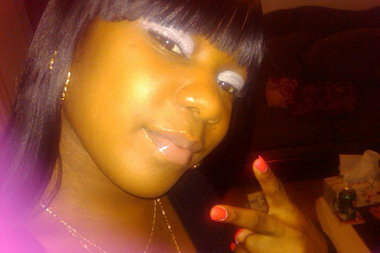 It's crazy," said Monet Robinson, who had known Blaine since childhood. "She was a fun person. She was very outgoing. She was a very nice girl. She liked to look good. She wanted to look nice." With reporting by Trevor Kapp, Ben Fractenberg and Serena Solomon.